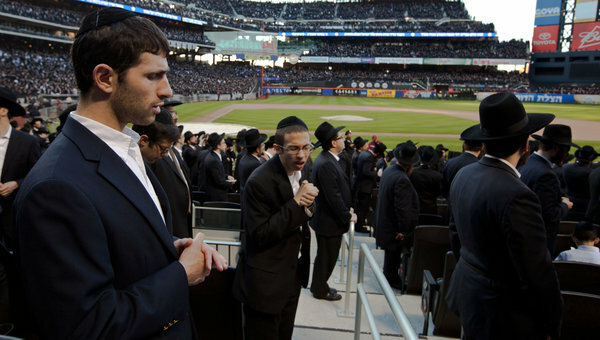 Jews praying at the Internet Awareness gathering, Sunday May 20, 2012, at Citi Field. Why was the press to negative about it? As discussed previously, the Internet Asifa was unprecedented. Individuals of other faiths, and even of no faith, have discussed the problems of the internet, but never has such a large community come together in such a public arena (spending quite a bit of money) just to raise awareness of it. In my opinion, it should have been cheered and heralded in the wider media as the unprecedented event it was. That was not the case, however. Given the general media’s long-standing misconceptions about and animosity toward religious Jews, it is not surprising. Nevertheless, one might have thought that the media would have at worst been indifferent. Yet, that too was not the case. It was incredible how often and how much these bastions of free access to information not only failed to convey the content, but used their platforms to air the typical prejudices against the religious Jewish world. You kind of expect the New York Post to come up with a headline like, “What a Kvetch at Citi!” Sadly, you also expect even the more “high brow” tabloids to freely employ the shameful pejorative “Ultra-Orthodox” (which among other things raises the question: Who are the Orthodox? In fact, I emailed that question to the writer of the New York Times article; so far no response). “Ultra”-Orthodox is a not-so-subtle way of saying “extremist.” It is the equivalent of calling everyone who is not religious “ultra”-secularist. It was also inevitable that there would be outright distortions, such as an MSN piece that claimed the event was streamed live on the internet, which if taken at face value would be the epitome of hypocrisy. Yet, the report conveniently failed to mention that the live stream authorized by the event organizers was restricted to a small number of locations where women could watch the event as it occurred. This entry was posted in Internet Addiction and tagged anti-religious bias, arthur asche stadium, Asifa, Citi Field, media bias, ultra orthodox, ultra orthodox Jews.